Moscow – a city of big dreams and contrasts, where skyscrapers tower above khrushevki and old trains pass through marble-spangled metro stations. But what are the places Muscovites find most inspiring in their city? We turned to Instagram to uncover the more unexpected sides of the Russian capital. Moscow is huge and busy. Cars drive down 14-lane streets in the centre of the city and at times it seems that there is nothing but concrete and asphalt for miles. But the heavy traffic and imposing high-rises belie the city’s swathes of greenery. Moscow boasts its own bay, a chain of canals and a resort area. This picturesque red bridge links the city to the Strogino district and Sosnovy Bor, where yachts moor by the canal and families lap up the rare days of sunshine by sunbathing on the beach. With wake sport and boats queuing for private hire, Strogino bay is an affordable getaway from the hustle and bustle of the city. Another unexpected escape is the Catholic Cathedral (Cathedral of the Immaculate Conception of the Holy Virgin Mary) on Malaya Gruzinskaya Street. It’s a perfect, neo-Gothic, dark red building that rises above a gigantic black monument by Zurab Tseretelli and the typical brownish-grey Soviet five-floor residential houses in the centre of Moscow. A hundred years ago, the area used to be in Moscow’s outskirts, inhabited mainly by Polish Catholics who worked on the construction of the railway linking Moscow to Smolensk and beyond to Europe. Once the biggest Catholic Cathedral in the Russian Empire, in 1938 it was attacked, ransacked and turned into a public dormitory, later to become a vegetable warehouse before finally being turned into a four-storey engineering bureau headquarters. You might not be able to walk among the palm trees in the original chancel now, but you can still enjoy a magnificent library and an organ music hall in the Cathedral’s renovated interior. Moscow is a city for big dreams. It has been a merchants’ city, a metropolis, a utopian capital, a playground for experimental housing, a regional financial outpost — and every ideology had to have a stone iteration. Noble mansions dwarfed wooden huts, energy stations overshadowed redbrick factories — construction was ideology’s main tool, and the financial fever of the 2000s was no exception. Big international companies came to Moscow and they needed modern offices. That’s how the White Gardens complex appeared on Belorusskaya Square, just a few minutes from the Cathedral. The glass buildings of the PWC headquarters trap the medieval church giving Muscovites and visitors a perfect snapshot of Moscow’s eclectic architecture. Brutalism, Constructivism, modernism — Moscow is a dictionary of historical architectural -isms, but some of its much newer constructions are also worth seeing. Unlike the era of former Moscow mayor Yury Luzhkov, when neoclassical palaces with alabaster columns attempted to pass themselves off as marble, the Aquamarine business centre on the left shore of the Moskva River is an ode to Constructivist functionality and minimalism. The 78,000-square-metre building flows surreally from Ozerkovskaya Embankment down the streets of Zamoskvorechiye like a giant white granite snake. 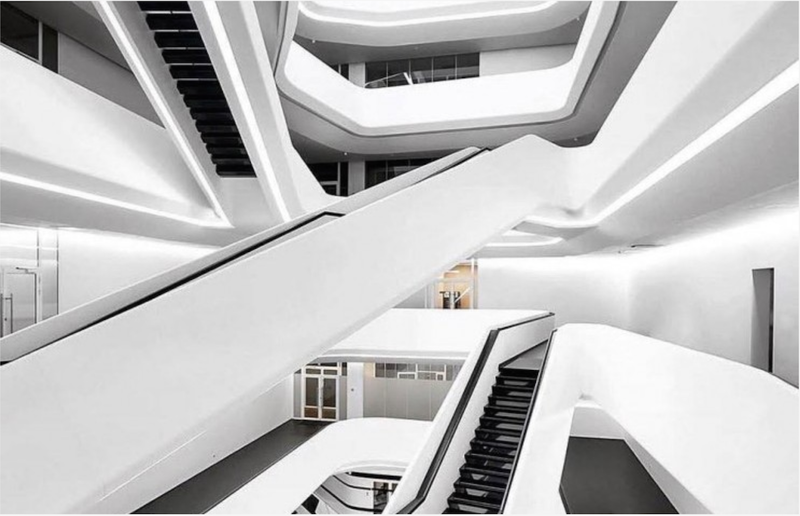 White waves also shape the interiors of the Dominion Tower Business centre, the only example of Zaha Hadid’s experimental architectural practice in Moscow. Imagine yourself taking your regular commuter ride between Venus and Jupiter, robots and smart machines sharing a coach with you. This is probably how a capsule spaceship may look in 2070 — light, functional, yet surreal. To the future and back — leave the building and you’ll find yourself in an industrial neighbourhood in southeast Moscow, old trams creaking past as you go down the street. Seven Sisters rising above the chaotic architectural maze below, millennial skyscrapers of the financial district, the icy waters of the Moscow river caressing the hilly grounds — a recognisable Moscow skyline, passing from retro postcard to Russian mafia movie scenes. The elusive beauty of the gloomy suburbs has lately become a new brand card of the city, and the moon hanging heavy in the skies above Moscow’s ubiquitous block housing is one of the signature snapshots of Buttechno, the well-known John’s Kingdom’s musician behind Gosha Rubchinskiy shows. A circular house, a house on stilts, the iconic Narkomfin constructivist residence — they are all notable architectural sights in the capital. But a house half a mile long? Surely not. Welcome to Tulskaya metro station, the arrival point that will lead you straight to the controversial experiment of the 1980s — the House of Nuclear Scientists, commonly referred to as “the ship”. The monumental building was designed to convey dreamy anticipation of a bright future, but over the years the dusty wind has buffed its white concrete facade into a pale brown skin. From the legendary Danilovskiy food market nearby, the building seems small, but don’t let that fool you. From the vantage point of the metro, it’s overwhelmingly striking. Very specific fashion, decoration and jewellery sets can be found in Sevastopolskaya market. Piles of cheap foreign tat would not be that exciting if not spread across nine floors of a Soviet hotel, each shop located in a separate hotel room with old lifts cruising up and down the concrete shafts carrying shoppers. The assortment ranges from huge mineral stones to smart kitchen utensils and Indian clothes. It’s a staple for party-goers looking for freaky party outfits or those wishing to replenish their bargain shop stock. Some shops offer a fantastic view over the city’s famed Soviet Block housing. Moscow is a city constantly under reconstruction, but some things stay the same. Like this petrol station that looks like it’s stepped right out of a Soviet movie. Even those familiar with the surrounding area overlook this bizarre, retro location. On one side is the gigantic Church of Christ the Saviour, which stands on the grounds of what was once the biggest public swimming pool in the USSR. On the other stands the Pushkin Museum of Fine Arts, hosted in an impressive classical palace. The blindingly clean Mercedes of Kremlin officials stop here to refuel, but unfortunately for ordinary folk it’s strictly forbidden. For more hard-to-find spots in Moscow and other Russian cities download our New East Travel Guide app. For recommendation on where to stay in Russia and beyond, check out our edit of amazing hotels and hostels across the New East.